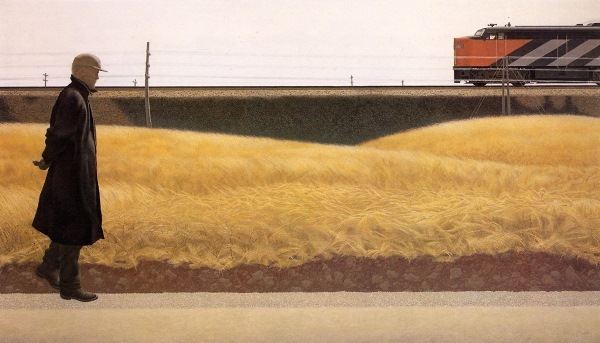 Yesterday, upon coming upon the notice in the NY Times of Alex Colville’s recent passing, I realized that Canada lost a giant of the art world. 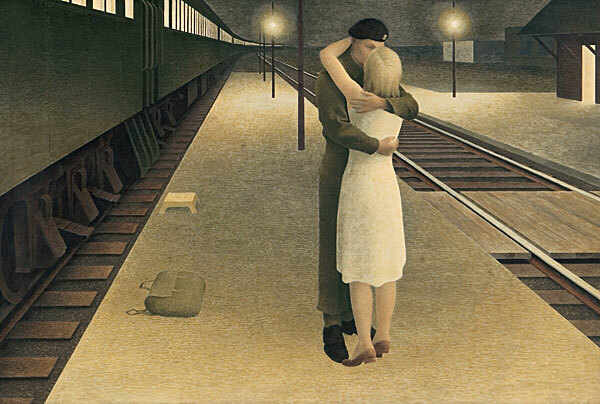 Colville’s brand of realism conveyed mystery and left much to the viewer. His striking composition “Horse and Train” is a perfect example of this. 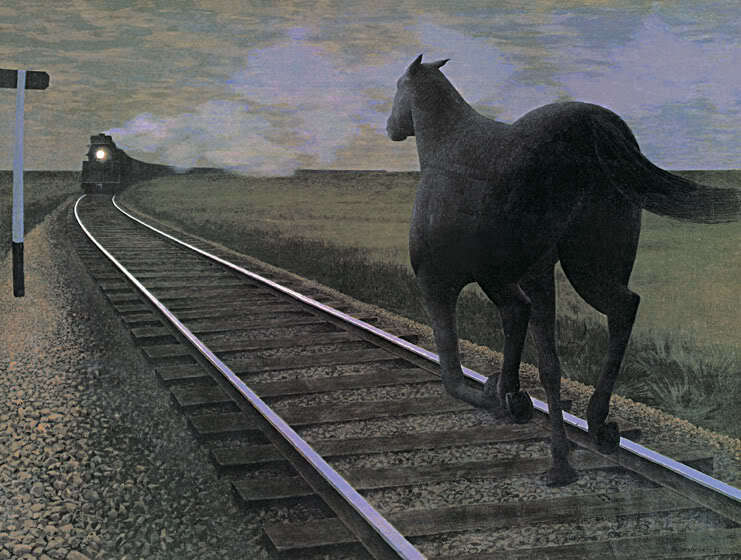 Its uneasy turbulence is illuminated by Colville’s explanation that his inspiration derived from a line in a Roy Campbell poem: “Against a regiment I oppose a brain/ And a dark horse against an armoured train.” Thus, did the Toronto-born and Nova Scotia-raised Colville movingly represent the struggle and strength of the individual against the mainstream. Fantastic! That and several of his other works are below. Reblogged this on It does not do to dwell on dreams and forget to live -Dumbledore. 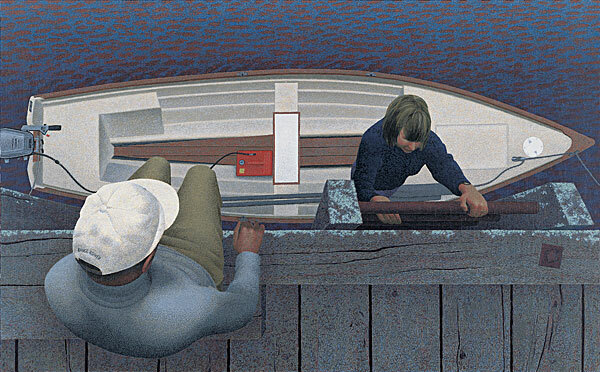 I have always been in awe of Colville’s work – often stood in stunned silence in front of his paintings. I felt quite a pang of regret when I heard about his death the other day. 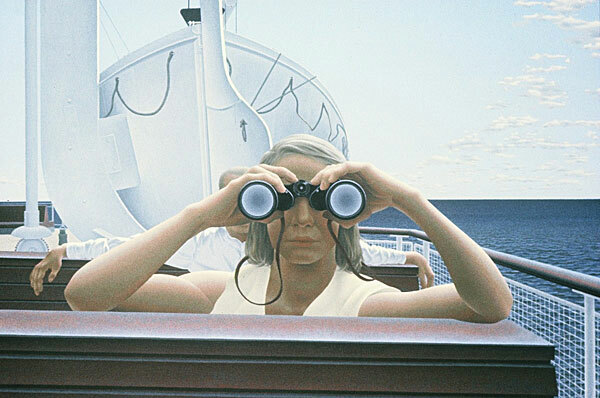 Thank you so much for featuring all of my favorite Colville works on this post. I first saw Horses and Trains when I was quite young and it haunted me (in a good way!) for years. Quite an individual indeed. I went to Mount Allison University, where he studied and later taught. I used to walk by Colville House–where he lived with his wife–everyday, and quite frankly I don’t think I ever appreciated how much he accomplished in his life. Hearing “Colville” in Sackville, NB was a common enough occurrence. Thanks for your comment and sharing the link from his school. Thanks for much for posting this tribute! 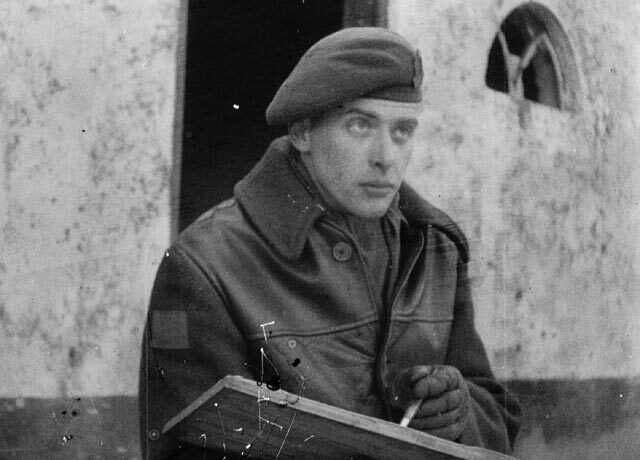 Alex Colville was a giant, remains a giant. As you can imagine, more visitors this past week at the AGO (Art Gallery of Ontario), where I’m a volunteer, have been asking to see any of his works we have on display. There are a number, and our tour guides have been paying special attention to them. I only learned last week that Horse and Train is in the Hamilton art gallery, so I plan to seek it out next time I’m there. What a wonderful place to be a volunteer! Wonderful observation — both were very good at conveying that emotion and sense. I agree — those are wonderful pieces. Brett would you mind if I reblog this on FreeValley Publishing? I think his life and work are inspiring and the readers would appreciate that story, and I also think the works he created, shown here, may inspire some writers to create even more beautiful works. Thanks for stopping in and for letting me know you liked my story, Chimera. -Sheri J. Kennedy. Sometimes true stories are the most amazing, especially when they are of someone who recognized the deep sense of story within everyday life and had the gift to share their vision. Please share your stories sparked by this story or the artworks within it by posting a link in comments or emailing them to FreeValleyPublishing@gmail.com. Thanks to Brett for permission to reblog his tribute. The Art Gallery of Ontario in Toronto will be having an exhibit of his works this summer. 🙂 I hope to see it.